It might not rise to the level of a miracle, but cosmetic dentistry can achieve some amazing outcomes with unattractive teeth. A skilled and experienced dentist can turn "ugly ducklings" into beautiful "swans." And that achievement might not be as in-depth or expensive as you might think, thanks to the increased use of dental materials called composite resins. Composite resins are pliable, tooth-colored materials we apply directly to tooth surfaces. They're most often used with broken, chipped or misshapen front teeth—the composite material replaces the missing tooth structure. Composite resins have been around for decades, but haven't been widely used because they didn't have the strength of dental porcelain. In recent years, though, dentists have perfected techniques for bonding and shaping composites to teeth that have increased their durability. With just the right skill and artistry, composites can look like natural teeth. We can correct many tooth flaws using composite resins right in our office. After roughening up the outer enamel surface of the tooth and performing other steps to aid bonding, we begin applying liquid resins to form a base layer that we then harden with a special light source. We continue to add layers to increase the color depth and shape of the restoration, before finally polishing it to resemble natural teeth. Composite restorations are ideal for moderate tooth structure loss, but may not be appropriate for heavily worn, previously root canal-treated or fractured teeth. These and other kinds of flaws may require a different solution such as a dental porcelain restoration with veneers or crowns. Where composites can be used, though, they provide an affordable option that doesn't require an outside dental lab for fabrication—we can often perform it in one visit. If you'd like to consider a composite resin restoration for a less than perfect tooth, see us for a complete examination and consultation. If your situation appears to be compatible for using this particular technique, composite resins could change your smile for the better in just a few minutes. Most dental problems arise from tooth decay and periodontal (gum) disease. But they aren't the only source of danger to your teeth—gastroesophageal reflux disease (GERD) could be just as damaging to your tooth enamel as dental disease. 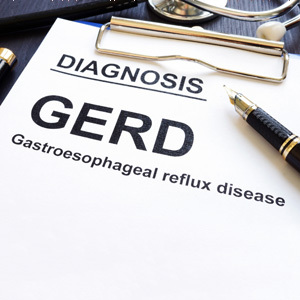 GERD usually occurs when a ring of muscles at the top of the stomach weaken, allowing stomach acid to enter the esophagus. This resulting acid reflux can make life unpleasant and pose potential health dangers—over time it can damage the lining of the esophagus and cause ulcers and pre-cancerous cells. It can also erode tooth enamel if acid enters the mouth and raises its level of acidity. This can be a problem because acid can soften and dissolve the mineral content of tooth enamel. This is the primary cause of tooth decay as acid produced by oral bacteria attack enamel. The more bacteria present, often thriving in dental plaque, the higher the potential levels of acid that can damage enamel. Stomach acid, which is strong enough to break down food, can cause similar harm to enamel if it causes higher than normal acidity in the mouth. There are some things you can do to protect your teeth if you have GERD, namely manage your GERD symptoms with lifestyle changes and medication. You may need to avoid alcohol, caffeine or heavily acidic or spicy foods, all known to aggravate GERD symptoms. Quitting smoking and avoiding late night meals might also ease indigestion. And your doctor may recommend over-the-counter or prescription drugs to help control your acid reflux. You can also boost your teeth's enamel health by practicing daily brushing and flossing—but not right after a reflux episode. The enamel could be softened, so brushing can potentially remove tiny particles of mineral content. Instead, rinse with water mixed with or without a little baking soda to help neutralize acid and wait about an hour—this will give saliva, the mouth's natural acid neutralizer, time to restore the mouth's normal pH level. And be sure you're using a fluoride toothpaste. Fluoride strengthens enamel—in fact, your dentist may recommend topical fluoride applications to boost the effect. These and other tips can help minimize the effects of GERD on your dental health. With an ounce of prevention, you can keep it from permanently damaging your teeth. The mark of a great dental restoration is that you can’t see it. It’s there in plain sight, but others observing your new and improved smile can’t tell the difference between the restoration and your natural teeth. Everything looks, well, natural. That’s the great advantage of dental porcelain. A dental technician with technical skill and artistic flair can form this inorganic, ceramic material into a life-like replica of your tooth, with a shape and color that blends in with the rest of your teeth. And because of its strength properties, porcelain restorations can hold up to the normal chewing and biting forces in your mouth, as long as you use prudence when biting down on hard substances. Porcelain is also highly adaptable to different kinds of restorations. For natural teeth still viable but no longer attractive, porcelain can be the main ingredient in two very popular and effective restorations, the veneer and the crown. Although the porcelain material is the same for both, their construction and application are quite different. Veneers are very thin laminated layers of dental porcelain custom-colored and shaped for bonding to the outer visible portion of a tooth. They’re a great solution for relatively decay-free teeth that have minor to moderate defects like chipping, slight misalignment or heavy staining. They often require some permanent removal of tooth enamel to ensure their appearance isn’t too bulky, but causes minimal impact to the tooth. Crowns, on the other hand, are complete tooth replicas that are bonded in place over an existing tooth like a cap. They’re a good choice for teeth in which the root and inner layers are still viable, but the tooth has been significantly damaged by decay or trauma. They’re also useful as a protective cover for teeth that have undergone root canal treatment. But unlike the minimal impact of veneers, crowns require significant tooth alterations to accommodate them. In either case, though, the end result is much the same: both crowns and veneers can be fashioned to precisely mimic the shape, color and texture of natural teeth. In skillful hands, these porcelain restorations can transform your smile for the better and no one but you and your dentist will ever need to know. The Golden Globes ceremony is a night when Hollywood stars shine their brightest. 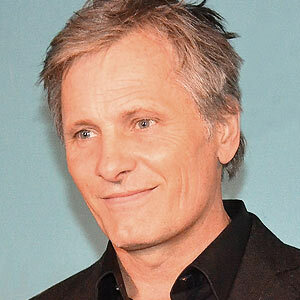 At the recent red-carpet event, leading man Viggo Mortensen had plenty to smile about: Green Book, the movie in which he co-starred, picked up the award for Best Motion Picture—Musical or Comedy. But fans looking at the veteran actor's big smile today might not realize that it once looked very different. A few years ago, an accident during the filming of The Two Towers took a major chip out of Mortensen's front tooth! That might be OK for some movies (think The Hangover or Dumb and Dumber)—but it's not so great for everyday life. Fortunately, Mortensen visited a dentist promptly, and now his smile is picture-perfect. How was that accomplished? He didn't say…but generally, the best treatment for a chipped tooth depends on how much of the tooth's structure is missing. If the tooth has only a small chip or crack, it's often possible to restore it via cosmetic bonding. This procedure can be done right in the dental office, frequently in a single visit. Here's how it works: First the tooth is cleaned and prepared, and then a tooth-colored resin is applied to the area being restored. After it is cured (hardened) with a special light, additional layers may be applied to build up the missing structure. When properly cared for, a tooth restored this way can look good for several years. For a longer-lasting restoration, veneers may be recommended. These are wafer-thin shells made of durable material (most often porcelain) that cover the front (visible) surfaces of teeth. Strong and lifelike, veneers can match the exact color of your natural teeth—or give you the bright, high-wattage smile you've always wanted. No wonder they're so popular in Hollywood! Because veneers are custom-made for you, getting them may require several office visits. If a chip or crack extends to the inner pulp of the tooth, a root canal procedure will be needed to keep the tooth from becoming infected—a situation that could have serious consequences. But you shouldn't fear a root canal! The procedure generally causes no more discomfort than filling a cavity (though it takes a little longer), and it can help save teeth that would otherwise be lost. 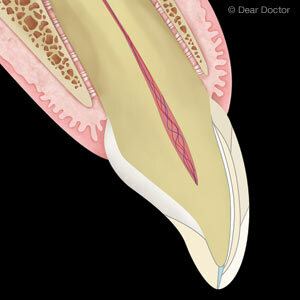 After a root canal, a crown (cap) is generally needed to restore the visible part of the tooth. If you're the principal caregiver for an older person, you may have already faced age-related health challenges with them. Good preventive care, however, can ease the impact of health problems. This is especially true for their teeth and gums: with your support you're loved one can have fewer dental problems and enjoy better health overall. 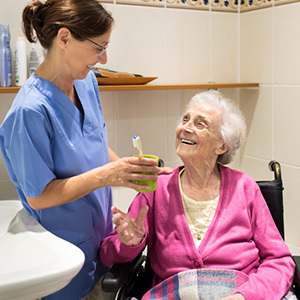 Here are a number of things you should focus on to protect an older person's dental health. Hygiene difficulties. With increased risk of arthritis and similar joint problems, older people may find brushing and flossing more difficult. You can help by modifying their toothbrush handles with a tennis ball or bicycle grip for an easier hold, or switch them to an electric toothbrush. A water flosser, a device that uses a pressurized water spray to remove plaque, may also be easier for them to use than thread flossing. Dry mouth. Xerostomia, chronic dry mouth, is more prevalent among older populations. Dry mouth can cause more than discomfort—with less acid-neutralizing saliva available in the mouth, the risk for dental diseases like tooth decay or periodontal (gum) disease can soar. To improve their saliva flow, talk with their doctors about alternative medications that cause less dry mouth; and encourage your loved one to drink more water and use products that help boost saliva flow. Dentures. If your older person wears dentures, be sure these appliances are being cleaned and maintained daily to maximize their function and reduce disease-causing bacteria. You should also have their dentures fit-tested regularly—chronic jawbone loss, something dentures can't prevent, can loosen denture fit over time. Their dentures may need to be relined or eventually replaced to ensure continuing proper fit and function. Osteoporosis. This common disease in older people weakens bone structure. It's often treated with bisphosphonates, a class of drugs that while slowing the effects of osteoporosis can cause complications after certain dental procedures. It's a good idea, then, for an older person to undergo any needed dental work before they go on osteoporosis medication. Keep alert also for any signs of dental disease like unusual spots on the teeth or swollen or bleeding gums. Visiting the dentist for these and regular dental cleanings, checkups and oral cancer screenings could prevent many teeth and gum problems.